June Carter Cash as Mrs. Dewey Sr. There's a scene early in “The Apostle” where Robert Duvall, as a Pentecostal preacher from Texas, is having a talk with God, who has to do all of the listening. In an upstairs room at his mother's house, the preacher rants and raves at the Almighty, asking for a way to see reason in calamity: His cheating wife is stealing his church from him. So far, the scene could be in a more conventional film. But then the phone rings, and it's a neighbor, complaining to the preacher's mother that someone is “carrying on like a wild man.” The call establishes that the preacher lives in a real world, with real neighbors, and not on a sound stage where his life is lived in a self-contained drama. His mother tells the neighbor that her son has talked to God ever since he was a boy, and she's not going to stop him now. “The Apostle” sees its characters in an unusually perceptive light; they have the complexity and spontaneity of people in a documentary. Duvall, who not only plays the preacher but also wrote and directed the film, has seen this preacher--named Eulis “Sonny” Dewey--with great attention and sympathy. Sonny is different from most movie preachers. He's not a fraud, for one thing; Hollywood tilts toward the Elmer Gantry stereotype. Sonny has a one-on-one relationship with God, takes his work seriously, and in the movie's opening scene, the preacher pauses at an auto accident to ask one of the victims to accept Jesus Christ, “who you're going to soon meet.” Sonny is flawed, with a quick temper, but he's a good man, and the film is about his struggle back to redemption after his anger explodes. As the film opens, Sonny is spending a lot of time on the road at revivals (we see him at one of them, made convincing because Duvall cast all the extras from real congregations). His wife (Farrah Fawcett) has taken up with the youth minister, and one night, sitting in a motel room, Sonny figures that out, drives home through the darkness, finds her absent from her bed and throws a baseball through the minister's bedroom window. His wife wants out of the marriage. And, through legal but shady maneuverings, she also deprives him of his church and his job. Sonny gets drunk, wades into a Little League game being coached by the youth minister and bangs him on the head with a baseball bat. Then he flees town (there is an overhead shot of his car circling aimlessly around a rural intersection; he has no idea where to go). Eventually he ends up in a hamlet in the Louisiana bayou, where he spends his first night in a pup tent supplied by a man who wants to help him but isn't sure he trusts him. Sonny changes his name to “The Apostle E. F.” and sets about rebuilding a small rural church given him by a retired black minister. His mostly black congregation is small at first, but grows as the result of broadcasts on the local 40-watt station. We see in countless little ways that Sonny is serious: He wants this church to work, he wants to save souls, he wants redemption. Like the documentary “Say Amen, Somebody,” the film spends enough time at the church services, listening to the music and the preaching, that we get into the spirit; we understand his feelings. “The Apostle” has become something of a legend in independent film circles, because Duvall was so long in getting the movie made. The major studios turned him down (of course; it's about something, which scares them). So did old associates who had always promised help, but didn't return his calls on this project. As he waited, Duvall must have rewritten the script many times, because it is astonishingly subtle. There isn't a canned and prefab story arc, with predictable stops along the way. Instead, the movie feels as alive as if it's a documentary of things happening right now. Consider a sequence where the Apostle E. F., who is a man after all, asks the receptionist at the local radio station out on a date. How will he approach her? How does she see him? He wants to find a way to make his desires clear, without offending her. She knows this. As played by Duvall and Miranda Richardson, the sequence is a brilliant observation of social and sexual strategies. Many of his scenes develop naturally, instead of along the lines of obligatory cliches. A confrontation with his wife, for example, doesn't end as we think it might. And a face-down with a redneck racist (Billy Bob Thornton) develops along completely unexpected lines. 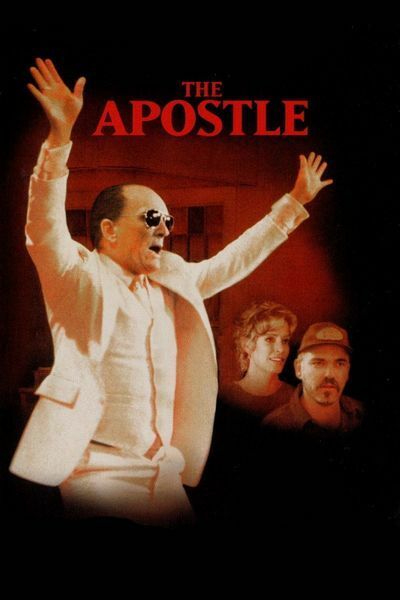 The Apostle E. F. is not easy to read; Duvall's screenplay does what great screenwriting is supposed to do, and surprises us with additional observations and revelations in every scene. Perhaps it's not unexpected that Duvall had to write, direct and star in this film, and round up the financing himself. There aren't that many people in the film industry gifted enough to make such a film, and fewer still with the courage to deal honestly with a subject both spiritual and complex. (Simple-minded spirituality is no problem; consider the market for angels right now). “The Apostle” is like a lesson in how movies can escape from convention and penetrate the hearts of rare characters.